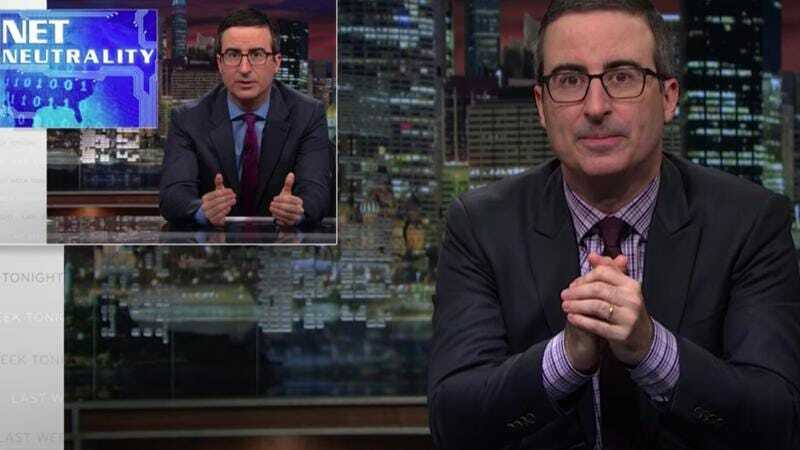 For its 100th episode, Last Week Tonight With John Oliver celebrated by buying a few domain names and temporarily crashing the FCC site—again. The first such instance occurred back in June 2014, when the show aired its first long segment on net neutrality. It turned out to be a singular episode, garnering attention for not only one of Oliver’s signature tirades, but also embodying the show’s goals: Taking what might otherwise be a really dry, but still important, subject, and turning it into something entertaining and illuminating for all of our sedentary asses at home. Viewers who weren’t already hip to it learned about the fight over ISP regulation, a struggle which eventually resulted in the FCC reclassifying the internet services as a utility. Former President Barack Obama backed the move, and was later supported by the federal courts. Naturally, our new commander in chief has put net neutrality on his list of things from the Obama administration that he must destroy, along with concepts that predate it, such as human rights. To wit, he’s appointed Ajit Pai, a man who once represented Verizon, as the new FCC director. Just a year after the internet was reclassified, Pai started going about dismantling the regulations that had been put in place. So John Oliver and his staff devoted another show to net neutrality, breaking down for viewers once more how easily internet providers could throttle speeds based on content, especially when the director of the government agency that ostensibly provides oversight says he’s fine with putting these billion-dollar corporations on the honor system. At the time of this writing, the page wasn’t back up yet either; clicking on gofccyourself.com takes you nowhere at the moment, while going directly to fcc.gov/ecfs/search-proceedings to enter the proceeding number (17-108) yields nothing at the moment. The other domain the show snapped up tonight was justtellmeifimrelatedtoanazi.com, which also reroutes to the FCC commenting page, but is similarly not functioning at this time. And sadly, it also has no information on the white supremacists that might be in your family tree.